On Wednesday 9th of June I visited Winsford salt mine. Located in Winsford in the heart of Cheshire, it is the largest salt mine in the UK. Winsford accounts for some 60% of all rock salt mined in the UK. Founded in 1844, the mine is the UKs oldest rock salt mine. Although in the early days miners used spades and mined by hand, now the mine uses state of the art mining technology such as the laser guided JOY excavator, which I saw up close and in action on my visit. Shaft four is used to pump clean air down in to the mine, to keep a healthy air flow underground. 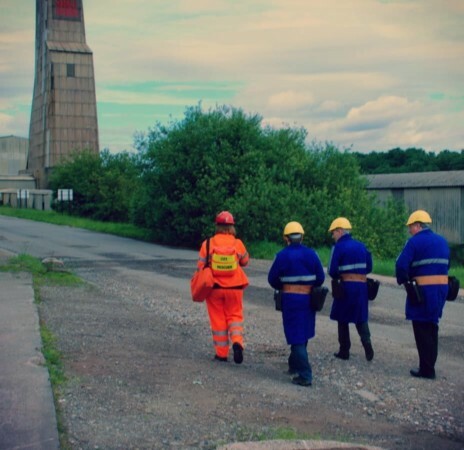 When we arrived at the mine the first thing to do was to get suited up in protective clothing: a thick blue tunic to go over our clothes (orange for the miners, blue for visitors), a yellow hard hat, a lamp and even a backup oxygen supply. Once kitted up we proceeded to go down shaft three, where we boarded an open-topped vehicle which would take us around the mine. With around 140 miles of tunnels to explore, it’s too big to go on foot! The first thing which hits you is the sheer volume of space excavated underground. The tunnels are 20m wide and 7.5m high, it feels more the size of a large sports hall than an underground mine! Our first step was the underground cinema. Yes, a cinema, in the mine! (Sadly no popcorn available). On the large projector screen we watched a short DVD about the history of the mine and the different techniques used to mine the rock salt. The mine uses two main techniques for mining salt, “drill and blast” and the JOY machine. Over the next two hours we would see each of these techniques up close and in action! We also learned about the honeycomb structure of the mine. This is a method of mining which requires no props or support structure to be built. Instead, the salt is excavated in a grid pattern and the un-excavated areas act as pillars, and hold the roof of the mine up. Undercutting machine – like a huge chainsaw with tungsten-tipped blades, this cuts a slice out of the wall, at the very bottom. This is again to help control the direction of the blast once detonation occurs. The drilled holes are filled with explosives, with varying detonation timers. Each blast is separated by half a second. Detonate! 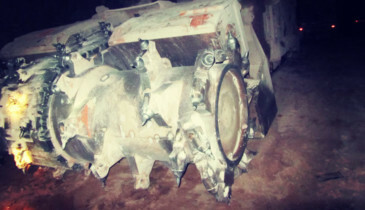 If all of the previous steps have been done properly, the blast face will collapse in a safe way, and the extracted salt can be sent to the crusher for processing. The entire process, from scaling to detonation, takes approximately one day to complete. We then moved on to see a more modern – and faster – method of rock salt extraction, the JOY machine. This machine is huge! It has a large rotating drum which just grinds away the rock face. The debris which falls off is then scooped up and sent along a conveyer belt – which can be several miles long – to the crusher. This is a much faster method of salt extraction as it can run continuously, and can erode vast amounts of rock face per day. This method accounts for some 90% of total salt production at Winsford. This machine [JOY machine] is huge! It has a large rotating drum which just grinds away the rock face. The debris which falls off is then scooped up and sent along a conveyer belt – which can be several miles long – to the crusher. Our next stop was to visit the crusher. This machine grinds down the chunks of salt mined using the various methods in to tiny grains of salt, typically either 6mm or 10mm in size. Salt from all over the mine comes in to the crusher, along conveyer belts, and passes through the crushing apparatus. The rock salt then goes through a filter, so that all grains of size less than 6mm are allowed to pass on, to the surface, and all bigger pieces are sent through the crusher again. This process is repeated until all grains are of a suitably small size. These grains will then be taken to the surface (up shaft 2), to be loaded in to wagons and dispatched, or to be stored above ground. The final stop on our tour was at the DeepStore facility. 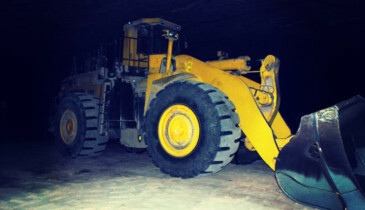 Located deep in the mine, this is an example of what the cavities underground can be used for, once the rock salt has been extracted. The salt mine offers a secure storage facility, and people store everything from masses of documents to works of art underground, in the constant temperature, constant humidity salt mine. DeepStore has been running for about ten years, and almost three million boxes are stored here. This concludes my visit to the salt mine, I hope you enjoyed reading it as much as I enjoyed visiting!